Eight personnel took part in our latest introductory session at Tedworth House, where as part of the RRP programme they made a marbled-paper notebook. All were enthusiastic about the lesson and expressed interest in going on to do further bookbinding at the Daffodil Barn workshop in Woodborough. Being only 10 miles away, accommodation and transport can usually be arranged at Tedworth House for those taking the courses at the Barn. Bound by Veterans were invited to take part in an event at the Worshipful Company of Stationers on Sunday, when the Hall, which is normally closed to the public, was opened up to all-comers for a day. BBV had a table inside the magnificent 450 year old Hall with its stained glass windows showing Shakespeare, Caxton and Tyndale amongst other notable figures relating to the written and printed word. 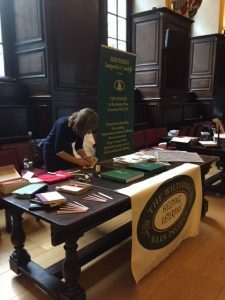 The Stationers have been sponsors of the charity since its beginning, and it was wonderful to be included in this special day, which despite the appalling rain, was a warm success. Other exhibitors in the Hall were Harmatan Leather, suppliers to the bookbinding trade; The Royal Bindery, who have four bookbinding apprentices at Windsor; Pureprint, one of the top printers in the country; Gateway Publishing, Extraordinary Editions who have just produced a commemorative centenary book for the RAF, and Shepherds Bookbinders with whom the charity is closely affiliated. 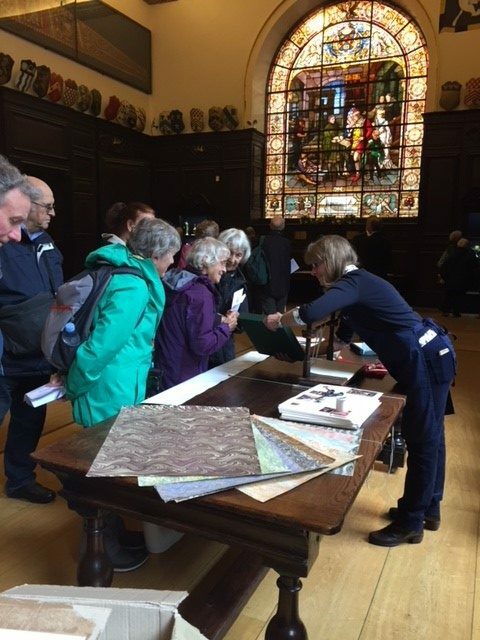 Several hundred visitors trooped through and Wendy Lagden did a magnificent job of explaining to all those who stopped to chat, what the charity did and who it was for. She was sewing information booklets all day as they were going like hotcakes, and thanks to her efforts many more people will be aware of what the charity does. Ali Strachan, Chair of Bound by Veterans (BBV), Jonathan Powell, founder of BBV, Sally Gregory and Wendy Lagden, (Volunteers in BBV) attended this year’s Tedfest held on the 2nd of August at Tedworth House and manned a ‘pop-up workshop’ stall which gave people, young and old, the opportunity to sample the delights of simple bookbinding. The workshop was set up under a large gazebo providing shelter from the blazing sunshine and the challenge for anyone who wanted to take part was first to fold an A3 sheet of paper to form a 16-page, A6 pamphlet with numbered pages. Then they stitched the spine and finally cut the sides which were folded to complete an A6-sized pamphlet which explained Bound by Veterans. Interest was slow at first but after some encouragement from Mike Quale and Sally amongst the fête-goers, the tables soon filled with attentive students. Many youngsters had a go and everyone was enthusiastic and interested both in the Bound by Veterans charity and the craft work. On 21st December 2017 HRH The Prince of Wales, the Patron of the charity AMAR (Assisting Marsh Arabs and Refugees), helped to bring the silver anniversary year of the charity to a spectacular close in Lancaster House. To mark the event he was presented with a beautifully bound book of photographs of the marsh arabs taken by Angus Beaton over the last decade. The album and a slip case were made in the Daffodil Barn by Bound by Veterans and it was a huge honour for BBV to undertake the binding of such an important document for such and auspicious occasion . Photo shows L to R: Jonathan Powell, Ali Strachen and Wendy Lagden from BBV and Angus Beaton photographer. Tony Webber, master craftsman from the Shepherds workshop in Victoria, visited last week to trial part of the new Level 3 City & Guilds syllabus. He spent two days instructing the techniques for making a quarter-bound leather drop-back box with rounded spine. A bumper seven Bound by Veterans students all managed to complete these splendid boxes [pictures to follow]. Welcome to our June edition of the Bound by Veterans Newsletter! We are delighted you wish to find out more about what we do.